I’m going to write about the past. Jonny is very near the end and today is not the day to delve into how that makes me feel. He has not woken up for over 15 hours and when the time comes, he will go. And it will be right. And we’ll be okay. I think. At the beginning of this year Jonny took me to Paris because I’d never been abroad. After a tricky few months of singledom it was an attempt on his part to win me back. It took me a very long time to decide to go; I thought at the very least I owed him closure on such an intense chapter of our lives. The whole day was beautiful, we took the Eurostar there and back, running from tourist attraction to tourist attraction in a bid to do ALL OF PARIS in a 10 hour period. It highlighted how different Jonny and I really are. For him it was happy go lucky, take your chances, jump on the metro and see where you end up. For me it was tense, unorganised and I got anxious every time I had to use my textbook French. I didn’t see the adventure or the romance in it, just the lack of structure and planning. 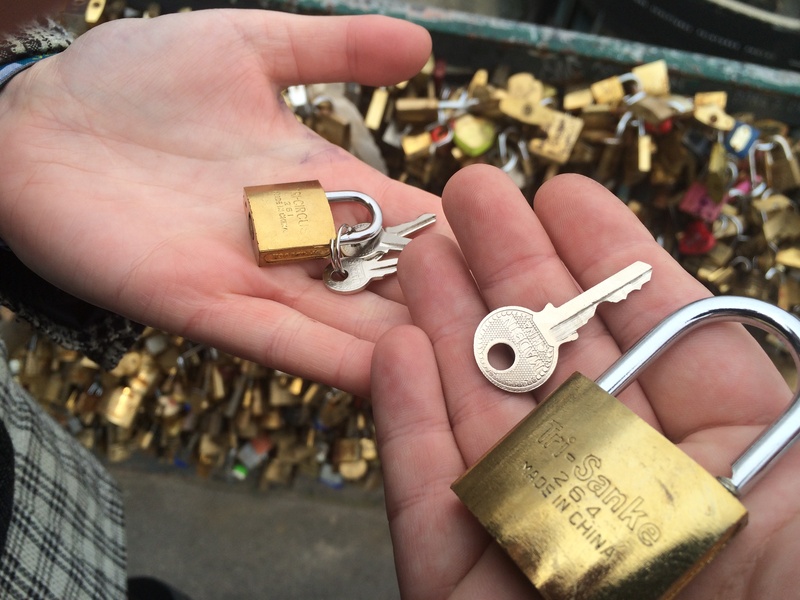 But back to Paris… Whilst there we visited one of the bridges across the Seine, famous for being covered in padlocks. Now I got caught in the fairytale charm of this; locking away your troubles and throwing the key in the river. This was my closure. Jonny and I bought padlocks, him a big one, representing the cancer, mine a smaller one to show my part in the whole miserable mess. Each had two keys, one to throw away forever, one to keep. Anyone who’s seen one of these bridges knows there’s no way you’d ever find your lock again. It’s all very sentimental, nostalgic and just the right side of corny. We locked away the cancer. Jonny first, then I locked mine onto his and we threw the keys into the water. I know it was a sappy affair; something to soothe the psychological side. But it worked. I got closure, he won me back, we drew a line in the sand and moved forward with life. And I know we were naive. And the cancer came back. But I still wear the key around my neck each day and whatever happens I try and focus on the fact we had the chance to lock away all the pain from the past, present and future and that will live on. That will stay with me forever. Your story is powerful. You are very strong and I admire you deeply for your bravery and persist love. I only wish to be half as brave as you.